If the cervical intervertebral disk ruptures, adjacent neural structures may be compressed. Compression of a spinal root may cause weakness and sensory loss in structures of the upper extremity innervated by that root. The severity of the clinical syndrome depends upon the site of compression by the displaced disk fragment. Often, intrinsic disruption of the disk occurs, but the adjacent ligaments hold, preventing complete extrusion of the fragmented cartilage. After trauma or spontaneously, the annulus may rupture and the nucleus may herniate into the spinal canal acutely. Often, however, the nucleus does not extrude but simply becomes desiccated and progressively degenerates, losing its biomechanical function and elasticity. The disk space gradually narrows, the joint becomes looser, and the cartilaginous end-plates of the adjacent vertebra touch, stimulating reactive osteogenesis. Formation of osteophytes around the joints of vertebrae is termed spondylosis. Degenerative thickening with ossification of the posterior interlaminar ligament or the posterolateral facet joint capsule may further contribute to compression of the cord in cases of spondylostenosis. Acute symptoms may follow trauma or be unrelated to injury. Neck pain radiating down the arm occur simultaneously, but spinal cord symptoms are rare. Decrease in a deep tendon reflex (biceps or triceps jerk) is common supplied by the compressed root. With foraminal osteophytes, episodes of cervical discomfort may recur over many months or years before radicular symptoms occur. Interscapular aching and suboccipital headaches are common associated complaints that may be explained as episodes of sequential radiation of referred skeletal pain. Straightening of cervical lordosis, limitation of cervical movements, and paraspinous muscle spasm. Weakness, fasciculations, muscle atrophy, depression of deep tendon reflexes, and dermatome sensory change in the upper extremities. Spasticity, weakness, and extensor plantar sign in the lower extremities. Radiologic evidence of narrowed disk spaces, formation of osteophytes, and spinal stenosis. MRI, CT, or myelographic evidence of extradural cervical cord or root displacement or compression, often at multiple levels. Plain x-rays may be normal except for straightening of the cervical lordosis. The lateral view may demonstrate narrowing of one or more disk spaces. X-rays may show osteophyte formation at the appropriate neural foramen in association with disk narrowing. This is usually best seen on oblique views. MRI is now being used with increasing success as the initial diagnostic study for patients with cervical radiculomyelopathy. Subarachnoid cerebrospinal fluid spaces, spinal cord and vertebral structures can be visualized without injection of contrast material, but resolution of osseous anatomic details may not always be as clear as is obtained with CT scanning, especially for visualization of vertebral fractures. CT scans of the spine are useful for evaluating the diameter of the canal and the foramina in patients with cervical spine stenosis. Osteophytes and posttraumatic deformities of the vertebral bodies and facet joints can be identified on CT, especially if they are calcified or ossified. Soft tissue lesions such as displaced disk or hypertrophied ligaments and joint capsules that may cause compression of neural elements in patients with spondylosis are less well visualized in the cervical areas by CT. Following acute disk herniation, MRI may show a small extradural defect. In cervical spondylosis, the sagittal image shows bar-like ventral defects at the disk space, usually at several levels and sometimes associated with apparent widening of the cord shadow on the axial projection if the spinal diameter is narrowed. CT scanning in conjunction with myelography also provides images of the relationship between vertebral and neural elements or in the sagittal and oblique planes using reformatted views. With contrast material demonstrating the size and configuration of the subarachnoid space. Cervical disk disease must be differentiated from traumatic and inflammatory disease affecting the soft tissues of the neck and pectoral girdle, such as deltoid or acromial bursitis and cervical intervertebral or shoulder joint sprains. Other conditions that must be considered include coronary insufficiency and angina pectoris; neoplasms of the pulmonary apex (eg, Pancoast tumors); primary peripheral or central nervous system tumors of the brachial plexus, cervical cord, or cervicomedullary junction; fractures, dislocations or subluxations of the cervical spine. The condition that is most difficult to distinguish from cervical radiculopathy is brachial neuritis. The disorder that most frequently mimics cervical disk disease is invasion of the cervical spine by metastatic tumor. Biopsy and surgical decompression or radiation therapy are indicated as emergency procedures, especially when a pathologic fracture or epidural mass lesion threatens spinal cord function. Permanent damage to the nerves and spinal cord may occur, with loss of motor and sensory function. 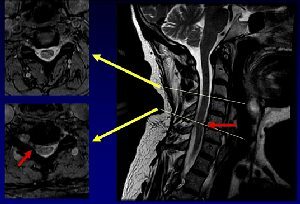 This is particularly true in cervical stenosis and spondylosis, in which both pressure on the spinal cord and compression of its vascular supply may produce a severe, progressive irreversible myelopathy with spastic paraplegia or quadriplegia that does not respond to surgical decompression. Such patients are also vulnerable to acute onset of paraparesis or quadriparesis initiated by relatively mild cervical hyperextension injuries sustained during a fall or motor vehicle accident. Initially, cervical disk disease should be treated medically unless there is a spinal cord compression or radicular motor loss in an extremity from severe neural compression. Medical therapy for patients suffering from radiculitis includes immobilization of the neck. Physical therapy to pain sites, including mild traction with the cervical spine, may be helpful. Analgesics, anti-inflammatory agents, muscle relaxants, and local heat are frequently used in combination with physical therapy. anterior decompression of nerve roots, spinal cord, or both. The choice is based on consideration of a particular patient’s anatomic lesions as demonstrated with MRI, CT, and dynamic flexion-extension radiographs. Seventy-five percent of patients with cervical radiculopathy will recover following an adequate trial (10–14 days) of medical therapy, even though some continue to have cervical or interscapular discomfort or mild paresthesias. In some patients, radicular or myelopathic symptoms recur upon return to full activity. Although patients with cervical disk disease can be managed symptomatically for years with intervals of physical therapy, others eventually require surgical therapy. For the 25% who do not respond to therapy, operation is required. Even after surgery, symptoms may reappear, perhaps because of residual or recurrent disease at the same or adjacent disk levels. In some instances, reevaluation for additional surgery is indicated. Improvement follows operative treatment of a cervical disk in approximately 80% of patients. Surgical treatment of cervical spondylosis results in improvement in 70% of cases and arrest of progression in many of the remainder.